We’d love your help. 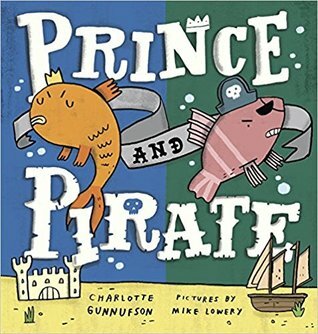 Let us know what’s wrong with this preview of Prince and Pirate by Charlotte Gunnufson. When two little fish with big personalities have to share the same tank, there are rough seas ahead! Prince and Pirate are proud masters of their very own fishbowls, and life goes along swimmingly--until they're scooped up and plopped into shared waters. Prince is horrified to find this cheeky cod trespassing in his kingdom. Pirate is sure this scurvy sea slug has come t When two little fish with big personalities have to share the same tank, there are rough seas ahead! Pirate is sure this scurvy sea slug has come to plunder his treasure. Thus, a battle of regal sneers, seaworthy stink-eyes, and off-the-hook insults begins. To ask other readers questions about Prince and Pirate, please sign up. I find it very probable that if you took two fish that had been living alone in their bowls and had them share a tank, that even with the larger space there could be some conflicts. I am not sure that piscine conflicts could be resolved with the addition of a dogfish, but children reading could easily bond over a pet, so I'm going to allow it. The first thing that caught my eye about Prince and Pirate was definitely the cover and the title - I could tell right away that this book was going to be a lot of fun. The cover is so well designed, and let's face it - who doesn't want to read an adorably illustrated tale about two fish, a prince and a pirate? As soon as I opened the book when it arrived (thank you so much, Penguin! ), my four year old daughter Check out this and other reviews on my young adult book blog, Here's to Happy Endings! As soon as I opened the book when it arrived (thank you so much, Penguin! ), my four year old daughter carted it off and started checking it out, happily pointing at the pictures and making up a story for the illustrations. She loves fish - she's had a goldfish for a few years and her favorite movie is Finding Dory, so anything to do with fish really makes her smile. When I sat down on the couch to read this to her, I realized that this wasn't just your every day average book about fish - it was a really fun adventure with fun dialogue, a great story, and eye-catching illustrations that make this book incredible! The story starts off introducing Prince the fish. Prince is happy in his underwater kingdom, complete with castle and carriage, and he is the ruler of his fishbowl. Then we meet Pirate. Pirate has a treasure chest and a pirate ship, and he rules his waters! And then it happens - the two fish are picked up and moved into a large, rectangular fish tank - together. When the two of them meet, they are incredibly unhappy. After all, Prince believes that he should rule the new kingdom, and Pirate believes that Prince is after his treasure. So the two of them spend time trying to get back at each other - Prince locks Pirate up in his castle's dungeon, while Pirate makes Prince swim the plank on his ship. After plenty of fighting (and funny conversations between the two), a new arrival shows up - a shy little dogfish. Prince and Pirate try to coax the dogfish out of his little house (which is a doghouse, because how adorable is that? ), they realize that the only way that they will be able to make him feel welcome is to actually get along. But can they get along, or are they just too different? I love the message that this book sends - that it is perfectly fine to be different, but you don't have to dislike others because of their differences. Instead, why not embrace the things that make you unique and get along, sharing ideas and making things more fun? 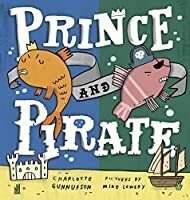 Prince and Pirate is the kind of book that you really want to get into and do the voices for - we have so much fun stepping into the characters of the book at my house and really making the story come alive. I can't even count the amount of times that I've read this book - both with my kids and by myself, because I just enjoy the book so much overall. The pictures are bright and friendly, and the story has engaging writing and is great for readers of all ages. there are rough seas ahead!" Prince and Pirate is fun children's book full of bright, vivid illustrations that will engage the reader and a fun, entertaining story that will keep the reader's attention right up until the last page. 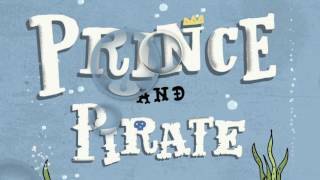 Prince and Pirate tell the story of two fish who both want to be the "king" of the fish tank and they both work so hard to prove who is the best...until......a new fish arrives. Once DogFish arrives both Prince and Pirate forget all about who is the best and they work together to try to make DogFish feel welcome. The "pirate" language that both Prince and Pirate use throughout the book is funny and kids will love reading this fun and entertaining story. Both Pirate and Prince are hard-headed, determined characters and neither wants to budge on who "rules" the fish tank. The words they use are supposed to be mean and stern but they really just end up sounding silly and kids will laugh at their attempts to be the ruler of the fish tank. The best part about this book is how the story shows kids how important it is to put your differences aside and work together. Life is much more fun with friends instead of being alone and friendship makes everyone happy! corner to corner to corner to corner. and the teensiest bit tuckered out." Gunnufson, Charlotte Prince and Pirate, pictures by Mike Lowery. PICTURE BOOK. Putnam’s (Penguin), 2017. $17. Prince and Pirate were each content ruling their separate watry kingdoms. Then one day they are thrown into the same, larger, tank. Neither is willing to make way for the other, until a third party comes along and they realize that playing together might be much more fun. Who doesn’t love a good pirate story! This will be so much fun to read aloud! Pre-K, EL (K-3) - ESSENTIAL. Cindy, Librar Gunnufson, Charlotte Prince and Pirate, pictures by Mike Lowery. PICTURE BOOK. Putnam’s (Penguin), 2017. $17. I thought this was going to be another silly fish/friendship story, but it is original by being set in an aquarium. I can imagine a youngster with a new aquarium making up this story as he watches his new fish! Text and dialogue includes appropriate language for young princes and pirates, and would be great fun to read aloud. Some words in larger, colored font beg to be read a-LOUD and with feeling. Full color illustrations support and extend the text, allowing the reader to watch carefully. This book is just fun! Two fish, who could not be more opposite, are forced to share a tank with each other. The Prince and the Pirate fish do not agree on anything, until a new fish arrives in the tank. The new dogfish helps them to find common ground and to be happy, by golly. The fish finally see that they don't need to be divided anymore. I imagine the moment where they use white pebbles to draw a line in the sand and separate out which parts of the fish tank belong to each of them would be familiar to those who shared a room with a sibling growing up! Miss 3 and I like to explore different books and authors at the library, sometimes around particular topics or themes. We try to get different ones out every week or so; it's fun for both of us to have the variety and to look at a mix of new & favourite authors. Prince fish and Pirate fish have to learn to get along in this story when they are removed from their private kingdoms and placed in a collective one. It isn't until a dogfish is introduced that the two decide to be friends. Filled with pirate phrases and princely swagger, the text is highly characterized and the illustrations are silly. The kids at storytime really loved this one. They loved the different kinds of language used by the prince and the pirate, and the antics of the two silly fish had them laughing the whole time. Add in the feel-good ending and the lesson that a lovable pet can bring people together, and you've got an all-around excellent picture book. This would be such a good story to do for a children's time. there could be two readers for the prince and the pirate. The craft could be fish or a fishtank or even a dog for the other fish. They were battling eachother. This was cute and teaches children that common goals can bring peace and harmony in a relationship. This is a cute little book about two fish who are forced to share a tank and eventually learn to get along. It might make a fun readaloud. The illustrations are vivid and imaginative. I loved it! Parents will enjoy reading it just and much as their kids. Great book to read out loud to kids and talk like a Pirate(or at least try to)! The illustration style fits perfectly with the characters. A lot of fish books this year but I think this one is the most appealing and accessible to kids. Two fish in tank are conceited and fight, then come together. I thought the conflict was easy to understand without getting obnoxious. Fun story about two fish who end up in the same tank and must learn to get along. A great message about how we don't have to be alike to get along and how we are stronger together combines with fun text and fantastic illustrations for some read aloud laughs and fun. Definitely recommended! A cute story with a powerful lesson about putting aside differences and learning to live together. I loved the sweet illustrations and the use of onomatopoeia (plip, plop, splash) made the story silly and fun to read! As a librarian I highly recommend this book for children! Great read! This book would be fun to read during a storytime using different voices. The kids would get a kick out of it. Two fish with two very big personalities are forced to share a fish tank. My daughter enjoyed this story and I did too. The illustrations were interesting as well. Would recommend. Good read-aloud for 3-6 y/o. Funny and cute, nice illustrations. Two fish discover they are not alone in the universe when they are transferred to a bigger tank. This was a cute book, but the story is hard for a little kid to follow, especially with all the royal and pirate-y slang. This one definitely made me chuckle. The prince and pirate characterizations and dialogue are too funny. I love how and why they come together, too. Two haughty goldfish must share the same tank and learn to get along. Hilarious! Will make a good read aloud with different character voices. A very cute premise about two very different personalities having to share a space. Writing could be stronger. Didn't capture and hold attention. Charlotte grew up in Minnesota, bossed by an older sister (who once tricked Charlotte into eating a worm) and pestered by a younger brother (who, among other misdemeanors, blew out the candles on Charlotte's birthday cake). Charlotte has since escaped to Iowa, where she writes and teaches Zumba Fitness classes. She has one handsome husband, three remarkable children, two blue cats, and five orange Charlotte grew up in Minnesota, bossed by an older sister (who once tricked Charlotte into eating a worm) and pestered by a younger brother (who, among other misdemeanors, blew out the candles on Charlotte's birthday cake). Charlotte has since escaped to Iowa, where she writes and teaches Zumba Fitness classes. She has one handsome husband, three remarkable children, two blue cats, and five orange fish.